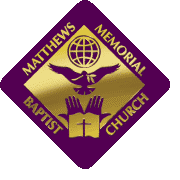 Welcome to Matthews Memorial Baptist Church! We are happy to have you join our loving church family. We stand ready to help you in any way we can to make you feel at home. You will find we are a warm, friendly, and caring congregation that is willing to be taught by the Holy Spirit as we constantly submit to the will of God through prayer in the name of Jesus Christ. Please, as your humble servant, I urge you to make the church part of your life. It is for people who are not perfect, people like you and me. Most of us are here because we need help in fighting the temptations that line our daily avenues of life. Our service of worship is a time for us to reach out in prayer (which is thinking on the highest level) for the help we need to overcome our weaknesses and fears. Here, the love of God resides, the sweet communion of the Holy Spirit is rejuvenating and refreshing, and Jesus Christ is our Eternal Redeemer. We are a high-spirited group of people who believe that prayer and Bible instructions are essential; congregational worship must be empowering, and the observance of the New Testament ordinances (Communion and baptism by full immersion) is faithfully exemplified. Matthews is an active church with much to offer for your spiritual growth and development. We have worship service at 7:30 a.m. and 11:00 a.m., with Sunday School at 9:45 a.m. As a new member, please join the New Members Class in the sanctuary during the Sunday School hour. At 7:00 p.m. each Wednesday, we have Prayer and Praise followed by Bible Study. For those who cannot attend on Wednesday evening, we also have Bible Study at 12:00 noon on Wednesday and at 11:00 a.m. on Saturday. We look forward to worshipping with you! Again, welcome to Matthews Memorial Baptist Church. As your faithful and humble servant, I strongly encourage you and your family to regularly attend and participate in our church worship services, our fellowships, and our church ministries. Your spiritual gifts, talents, and stewardship are needed here at Matthews, as we seek to carry out our God given mission of evangelism. Dr. C. Matthew Hudson, Jr.